Non-ethanol fuel new to NB gas station - Bradigan's Inc. 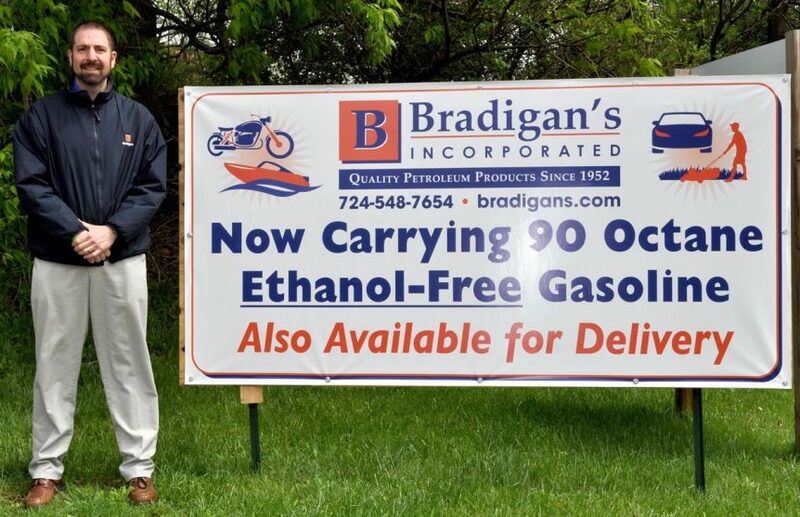 Earlier this month, Bradigan’s Incorporated began offering non-ethanol gasoline at its New Bethlehem KardGuard station — previously known as Heffner Brothers — located along Broad Street as another fuel option for its members. According to Bradigan, the company’s first attempt at providing 90 octane non-ethanol gasoline began last April at the main Kittanning location as a replacement for the mid-grade 89 octane fuel, which was becoming noticeably less popular with consumers than regular and super grade fuels. In fact, Bradigan continued that several customers in the Kittanning area using non-ethanol gas have reported noticing an increase in the fuel economy of their vehicles, as well as smoother running engines with fewer problems after setting idle for long periods of time. “There are several major benefits we are hearing about,” Bradigan added, noting that one customer even reported that their vehicle traveled 78 miles farther on eight gallons of non-ethanol gas than it did on the same amount of ethanol gas. Unlike most fuels that have contained 10 percent ethanol since 2010, Bradigan said the reason for the popularity spike in the 90 octane non-ethanol fuel, especially in rural communities, is that it contains no ethanol. Although most regular passenger car engines are made to handle the small percentage of ethanol, Bradigan explained that because it is a solvent, ethanol can potentially deteriorate and damage the smaller engines of old muscle cars, lawn mowers, farm tractors and similar vehicles. “These engines are not designed to handle the 10 percent ethanol,” he said. He added that another big issue with ethanol gas is the chance of it becoming contaminated if it comes in contact with water. “Water and ethanol don’t mix,” Bradigan continued, noting that contaminated gas has to be pumped out of the vehicle’s tank in order to avoid damage to the engine. When discussing which gas station location would benefit most by offering non-ethanol fuel, Bradigan said that as a rural area similar to Kittanning with a lot of ATV riders, farmers and landscapers, New Bethlehem came first to mind. “There were a lot of indicators that the area could benefit from non-ethanol gasoline,” he said, explaining that the newly blue painted pump three will be the only pump at the New Bethlehem station to offer non-ethanol gas. Ethanol-blended gas as well as diesel fuel will continue to be offered at the other pumps. While there are many benefits to using non-ethanol gasoline, Bradigan noted, however, that because the government only offers subsidies for gas suppliers whose products contain 10 percent ethanol, non-ethanol gasoline runs between 80 and 90 cents more per gallon than ethanol-blended gas. For more information on our KardGard Fueling Program, or to complete an application click here.